A massive 65-inch Samsung television with 4K resolution and HDR support for less than $1,000 is indeed a rare sight. But throw in a $200 gift card and this is easily one of the best Cyber Monday entertainment deals we've seen. I mean, what else is there to say, other than "yes please"? Samsung 65-inch curved 4K TV with HDR $999 (was $1499) + $200 gift card: Yes, it really is that big. Yes, the picture really does look that nice. Yes, the deal is really that good. 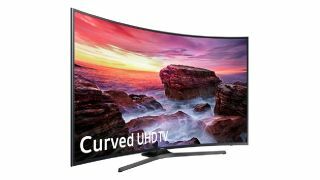 Samsung 55-inch curved 4K TV with HDR $699 (was $999): The same series, the same features, just wrapped up in a slightly smaller package. Of course, it ain't gonna look small in your living room. Fifty-five inches is still fifty-five freakin' inches. You know what would go great with either of those TVs? A gaming console to take advantage of its increased resolution and HDR. Oh hey, look at that - we've got a list of the best Cyber Monday PS4 deals (so you can save on PS4 Pro) and a list of the best Cyber Monday Xbox One deals (so you can save on Xbox One X) right here. Enjoy!